The Academy of Vocal Music at Santa Susana High School is a nationally recognized program of excellence. Our choirs have performed on TV on CNN, ABC, CBS, MSNBC, FOX, performed for Heads of State, Presidents, Prime Ministers, Governors, and other noted dignitaries. Performances have also occurred in Germany, Hawaii, Florida, Washington, and New York. Certificates are offered to students who complete the coursework for an academy emphasis in Vocal Music. Students who complete the certification program will leave with a portfolio of works performed in ensemble and solo performances and a comprehensive understanding of different genres within vocal music. The Academy of Vocal Music at Santa Susana is a performance-focused series of courses for all genres of music and is a nationally recognized program of excellence. Santa Susana High School’s Vocal Music pathway, in the School of Visual and Performing Arts, is a performance-focused series of courses involving the understanding of and appreciation for all genres of music, alongside studies of the music industry and the professional careers found within it. Students will take part in their choice of five choirs, some traditional and some contemporary-focused, in order to build their abilities in music theory, vocal technique, and in some cases, choreography. Santa Su’s audition only choirs Abbe Road A Cappella, Advanced Women’s Choir, Vocal Ensemble, Women’s Choir, as well as the musical-theatre based Show Choir, have all earned superior ratings at numerous national and local festivals, as well as incredible performance opportunities such as Nancy Reagan’s Funeral, the Disneyland Candlelight Processional and the International Championship for High School A Cappella for Abbe Road in 2018. Students have the opportunity to travel both nationally and internationally, providing them with opportunities to perform in amazing locations and learn about different regions and cultures. High community involvement also gives the SSHS choir program the ability to perform at the Reagan Library at least once per year, as well as access to solo-vocal events in Simi Valley. Working with expert accompanists, vocal coaches, choreographers, and costumers, the experiences students gain are at a professional level. With opportunities throughout the year to collaborate with theatre, film and stagecraft students, as well as professionals in the industry, vocal music students will gain an understanding of all of the options within the music profession. Most importantly, students get to take part in three vocal music concerts per year, each with its own theme, allowing choir students to develop their performance skills in front of a live audience. Abbe Road A Cappella (Jazz Choir)As the capstone course, and the most selective ensemble at Santa Su, Abbe Road is a sixteen part A Cappella choir with an emphasis on modern pop music, performed with voices only. Students get to explore the wonderful world of a cappella voice, involving songs from across all genres and styles from award winning arrangers such as Shams Ahmed and Ben Bram, as well as the ability to attend several masterclasses from groups such as Groove for Thought and Filharmonic in previous years. Certain years, students are also given the opportunity to compete at the Los Angeles A Cappella Festival and International Championship for High School A Cappella, participating in the real life version of Pitch Perfect. Additionally, the course involves a dense amount of student leadership with the Student Coordinator position, where students work as a musical and technical leader, running class and representing the department on social media, as well as a multitude of choreography opportunities for both competition and performance. Members will also learn invaluable music industry standards in performance and musicianship. For upper-level treble singers, this auditioned ensemble involves challenging and interesting music from all eras, by splitting the focus between traditional choral music and contemporary a cappella. By singing both a cappella and accompanied pieces, students get to perform a multitude of songs that will both challenge and fulfill their musical abilities, often splitting into small groups to perform collegiate-style, contemporary a cappella music at the end of the year. Past groups have won praise at a multitude local festivals, as well as the opportunity to perform at the memorial services for Nancy Reagan and Sgt. Ron Helus. Students will develop their knowledge of scales, sight-reading and higher level music theory. As part of the pathway to Santa Su’s musical theatre department, this audition-only, mixed ensemble involves a focus on both singing with intention as well as dancing with it. 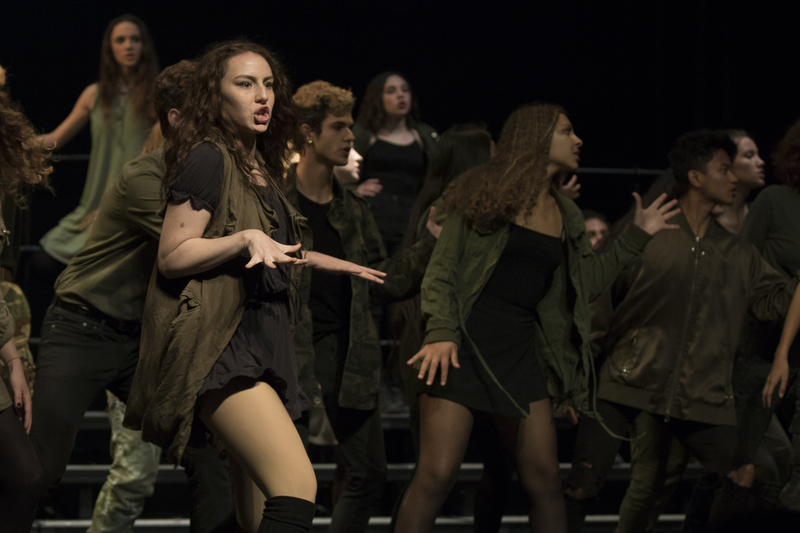 Performing spectacular musical medleys, such as Grease, Dear Evan Hansen, and Hamilton and more, students will develop movement skills alongside their vocal skills, work to become adept performance artists in any venue. Many students from this fast paced course have gone on to be a part of our Musical Theatre class. This course also offers a high number of student leadership opportunities for members who are interested in choreography, giving upperclassmen the ability to choreograph pieces for the concerts. Students will also learn scales, sight-reading and basic music theory. For both treble- and bass-clef singers, this audition only ensemble is a foundation to learning harmony and part singing for every vocal student at Santa Su. Vocal Ensemble approaches a wide variety of music, allowing students to further develop musicianship in multiple styles and languages. Students are expected to learn about two to four pieces per show, each one involving a new genre or era than the last, and each requiring attention to different aspects of vocal performance. All the while, students will conduct research on the music industry for a semester project, where they will demonstrate their new skills in music. Students will also learn scales, sight-reading and basic music theory. This audition only performance ensemble is the entry point of the vocal music program for treble clef singers, where they can dive into the world of high school choral singing and learn the techniques and skills necessary to grow as a vocalist. Singing a variety of genres and styles, as well as occasional choreography, students get to explore their musical horizons, and branch out from classical choir pieces to modern pop songs. All the while, students will conduct research on the music industry for semester projects, where they will discover the many different facets and opportunities that lie within it. Students will also learn scales, sight-reading and basic music theory.